Ernst Jünger - Anarch: Jünger Translation Competition! The German Department at the University of Bristol is holding a translation competition and invites translations from German into English of extracts from some of Ernst Jünger’s travel writings. Prize money will be given to four entries, with one category limited to entries from current undergraduate students, and numerous book prizes will also be awarded. The deadline for submission of entries is 1 July 2013. Entries will be judged by Julian Evans (London), Christophe Fricker (Bristol), Thomas Friese (Vienna), Petra Rau (Norwich), and Robert Vilain (Bristol). More information as well as an entry form is available at www.ernst-juenger-translation.info. Ernst Jünger (1895-1998) was one of the most significant writers and thinkers of 20th-century Europe, and is one of the most controversial. He became famous with the publication in 1920 of In Stahl­gewittern [Storm of Steel], an account of his experiences in the trenches in the First World War. In the following eight decades, Jünger published more than fifty works, including diaries, novels, stories and essays. His novella Auf den Marmorklippen [On the Marble Cliffs, 1939] is a thinly veiled critique of the Nazi regime. Tributes by writers of international stature (including Jorge Luis Borges, Bruce Chatwin, and Heiner Müller), as well as visits from European heads of state and government (such as François Mitterrand, Roman Herzog, Helmut Kohl, and Felipe González) have helped secure Jünger a prominent place in intellectual debates across Europe. In recent years, Jünger is emerging as a hidden ancestor of contemporary theoretical and societal discus­sions. Expert and popular audiences across Europe have become part of this development. 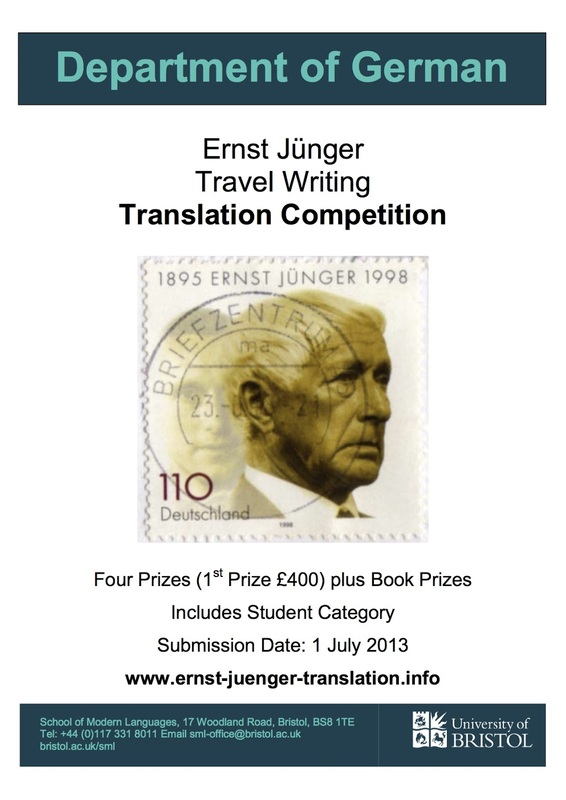 This translation competition aims to promote the study of Ernst Jünger’s works in English.